Ocean activities are great fun for an end of the summer activity. Many of us took a trip to the beach over the summer. Why not keep the fun going once you get home? If you didn’t get a chance to head towards sand, you can use these ocean activities to learn without ever leaving the house! 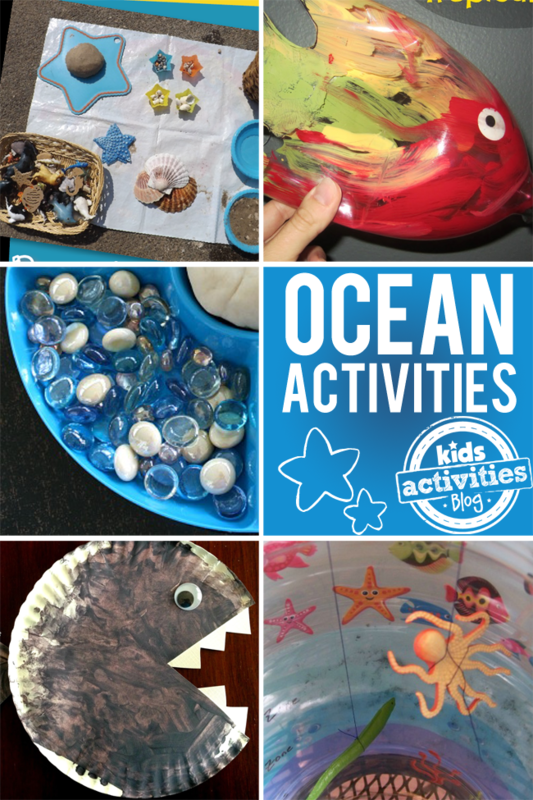 We’re sharing our favorite ocean activities from our Wednesday link-up, It’s Playtime! You can show us yours, too! 1. Let your kids explore with ocean in a bag. Use a plastic baggie with hair gel as the water and fill it with sand and pretend fish. And make sure to duct tape the bag shut! 2. Have fun with outdoor ocean play by setting up a little ocean station. Gather seashells, starfish, and other pretend sea creations and let them play. 3. Replicate what its like on the ocean floor with a discovery bin. Get some of colored sand at a craft store and throw in some plastic sea life. Let your little ones dig around and discover different things that live in the sea. 4. Create one of the oceans most beautiful animals, the tropical fish with a soda bottle, some paint and this template. 5. Play with seashells and create some pretty art by gluing them onto cardboard with sand and glitter. 6. This is a really amazing ocean scape you can use to learn about the ocean zones. Pair this up with Wish for a Fish by Dr. Seuss! 7. For the younger ones, try this O is for ocean craft by painting a paper plate blue and letting them place ocean stickers on it. 8. For the even smaller kids, let them make a paper plate shark by simply finger painting a plate. Then, mom or dad can add teeth and a tail. If you want to share your kids activities, head back here at 4pm today to link up! Thank you for including our shell activities! Fun ideas for the end of summer! Thanks so much for including our Ocean-scape!